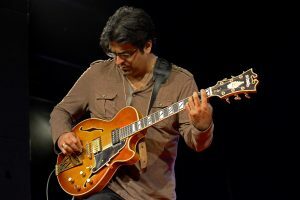 Wildly acclaimed NYC-based guitarist Rez Abbasi brings his quartet Junction to Natalie’s Coal-Fired Pizza on Friday, July 27th at 10pm (tickets here). I was lucky to speak with Abbasi by phone and that conversation along with video and audio are below. For the last 20 years, Rez Abbasi has been honing a singular, unmistakable voice on the electric guitar and writing some of the strongest, most malleable compositions in contemporary music. His 2011 appearance at the Wexner Center, with the larger group Invocation, was my first exposure to Abbasi and left a deep impression. Everything I’ve checked out of his since, live at Winter Jazz Fest in New York or on record, has deepened that initial understanding and drawn me closer. Don’t miss one of the world’s finest jazz guitarists and composers tackling this thorny, intriguing material in one of Columbus’ best listening rooms.